This study was done to determine mean of radius of curve of spee in different vertical patterns. 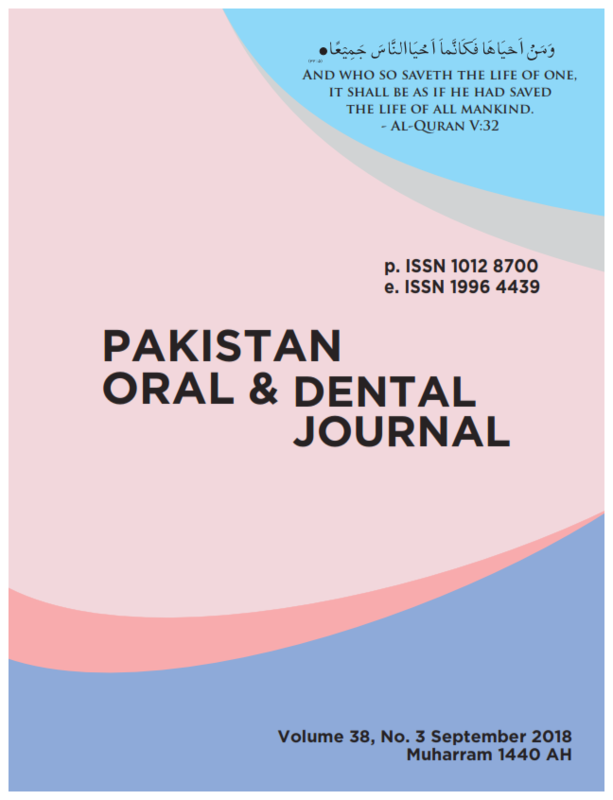 It was cross sectional study design with 106 patients from department of Orthodontics, dental OPD Karachi Medical and Dental College, Abbassi Shaheed Hospital, Karachi, Pakistan. The data collection procedure was non–probability consecutive. After thorough history and clinical examination for evaluating the inclusion and extrusion criteria patients were recruited for the study. All measurements were recorded on a predesigned Performa. Frequency test was applied for radius of curve of spee and mean value was 33, 56 and 17 for high, normal and low angle respectively. Test shows that highest angle noted is normal that has 56 value for collected data. Low angle is rarely present that is 17 and high angle is present in between with values of 33. It was found that value of radius of curve of spee was highest for normal angle followed by high angle then low angle subjects.